A new medical device could facilitate the regeneration of severed peripheral nerves in the hands and limbs, incurred during trauma such as car accidents. 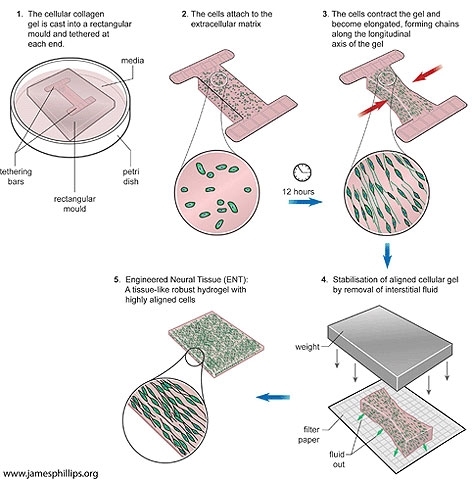 Dr James Phillips of the Open University has developed, patented and tested a suite of tissue engineering technologies that he hopes to package and commercialise for clinical use. Around 300,000 individuals of working age incur peripheral nerve damage in Europe each year at a cost of several billion euros. If a cut is only partial or very clean a surgeon can simply rejoin the two ends of a nerve. Sometimes, though, this is not possible — there might be a gap that cannot be stretched or entire section lost — and the surgeon must take a nerve bundle from another part of the body. This nerve autograft is the ‘gold standard’ procedure, but means further trauma and secondary surgery with loss of function at the donor site. Over the past decade, researchers have been experimenting with artificial nerve guides or ‘conduits’, which are essentially hollow tubes made of biopolymers or silicone. ‘If you’ve only got a centimetre to bridge, tubes are really good, but with a longer gap you’re asking the axons to grow without any support structures,’ Phillips said. These support structures are things such as the insulating schwann cells that surround the nerves like electrical wiring. The new method starts with slaps of rectangular collagen gel, seeded with schwann cells. This self-aligning technology is the key innovation in the work and allows the regenerating nerve to grow for long distances. The next process stage is to remove the fluid from the gel (which is 98 per cent water to begin with) to get a dense but very thin sheet of 100 microns, which is folded up ‘like a swiss roll’. The engineered tissue rods are then inserted into tubes ready for graft. These nerve conduits have been tested in rats with peripheral nerve injury, where they accelerated nerve regeneration. Phillips is now looking for device companies that could automate all or part of the production process in order to achieve a device suitable for full clinical use. Feasibility studies have suggested that the worldwide market for such a device could be worth around $50m annually. Someone has lost the sensation in the legs and unable to move them after a spinal cord surgery. I guess this is due to damage of the nerves. Is this technique be useful in this case?